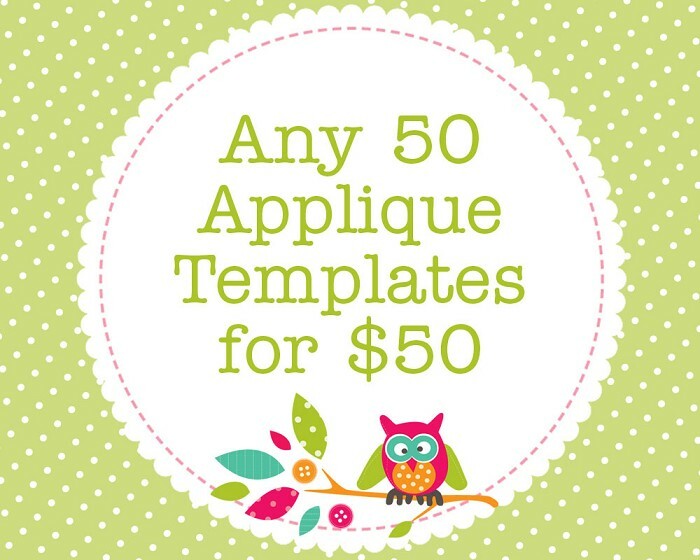 Save when you buy 3 or more of my applique templates. This listing is for fifty (50) PDF applique templates. Please see the individual listings in my store under the category "Applique Templates" to see what designs I offer. ♥ Please note you will receive the TEMPLATES ONLY not the actual applique patches. The photos show examples of use. • Embellishing tshirts, onesies, pants, bibs, baby blankets, quilts, hats, bags etc. Your imagination is the limit! 2. In the message to seller box upon checkout, state which templates you would like. © 2011 Angel Lea Designs. The templates may not be sold, shared or distributed in any form, and any iron on appliques made using the templates may not be sold. However, if you wish to apply any appliques you make to handmade items that you sell, you may do so, but please read my policies first as terms and conditions apply. Visit my shop to find other multiple purchase discount listings plus many more applique templates. Australian customers - I accept payment by PayPal and direct deposit. If you choose to pay by direct deposit my bank account details will be provided to you upon checkout. International customers - I accept payment by PayPal only.